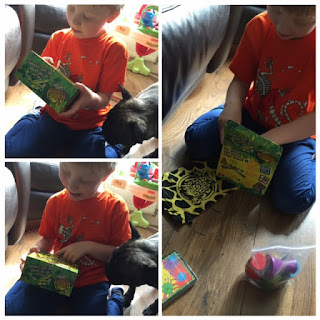 As well as receiving the lovely Dobble game to review, Logan and I were also sent the awesome Jungle Speed Safari. The game arrived in a little colourful box crammed with exciting pictures and snippets of how to play the game. Logan couldn't wait to get his hands on this and have a play so we tore it open straight away. Upon opening the box we were greeted with a packet of cards, some wooden totems, a rule book and a draw string bag to keep everything. The bags actually very handy so a big well done to who ever suggested that be included with the game. So how do you play Jungle Speed Safari, well maybe the name gives it away a little. You have to be fast! Make jungle animal noises! And there's even a hunter to avoid! The game can be played with either 2 or up to 6 players and is recommended for 5 years +. Each game normally takes around 15 minutes which is perfect especially if you have an active child who struggles to hold their attention for long. Logan couldn't wait to have a shot of this game so we set it up after Daddy had a read of the instructions and showed us how to play. For the record I'm rubbish at reading instructions and need someone to physically show me what to do hence why Daddy is very helpful. Anyway, as you can see from the photos below if there's 2 players it's easiest to set the game up so you are sitting across from each other. You put all 5 totems in the middle and then deal out the cards face down. Once the cards are dealt that's when the fun begins. The top card on your pile gets flipped over quickly and put in front, the first player to act on that card and do the correct task normally wins the card. There's 5 different types of cards in this game. There's a normal card with a green leaf background and there's an animal on it. This card is normal as you don't have to do anything with it, basically you can have a rest. The hungry animal cards have a blue background with an animal on them, this is when you have to hit the totem faster than your opponent depending on which animal it is. The totems have different foods on them so banana for monkey, meat for lion, leaves for giraffe etc and the fist player to hit the correct food when a hungry animal card is draw wins that card for their pile. The angry animal cards have a red and sort of lightening bolt background and a very angry animal on them. 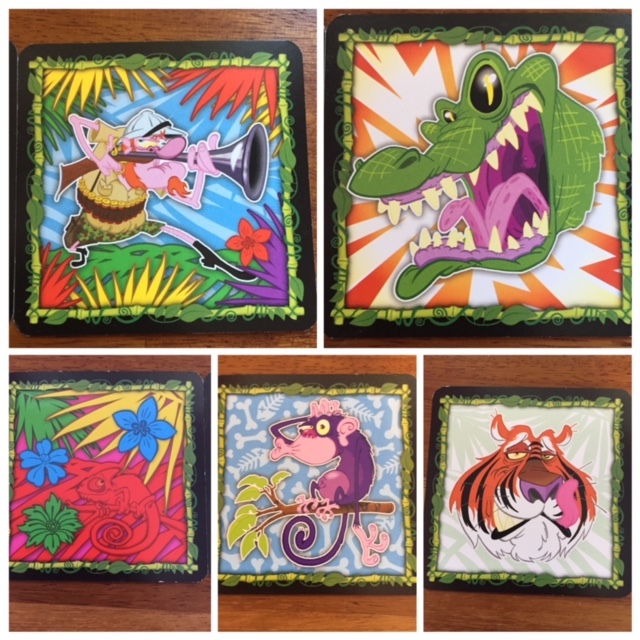 The first player to imitate that animal wins the card. Then there's the chameleon cards which are colourful and you have to hit the coloured totem that is the same colour as the chameleon, but it's tricky with all the colours getting you mixed up. Lastly there's a hunter card and this is Logan's favourite. If you pull the hunter card you have to hit an opponents card pile as fast as possible to steal a card. If you cover up your own pile then you get shot in the foot and the card has to go in the middle, no one gets it. If your opponents cover their cards quicker than you can hit them then you don't get any cards. So what did Logan and I think? Well in short, it's awesome. 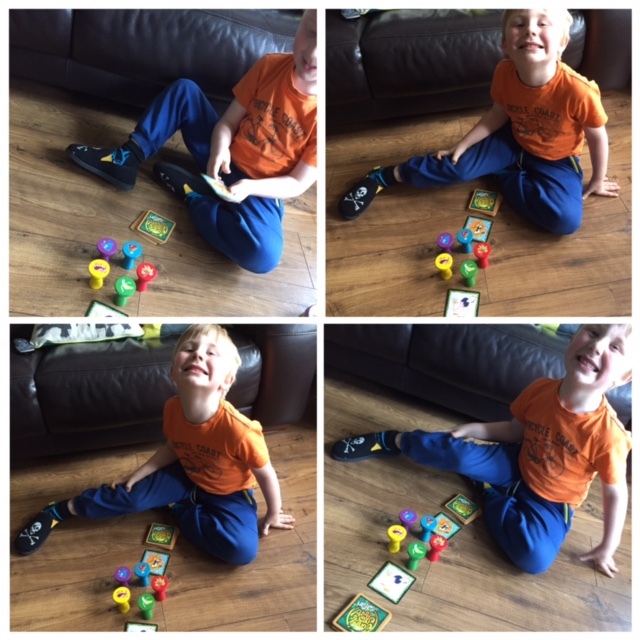 We've played this game together so many times and if he's in a grumpy mood it always puts a smile on his face to play Jungle Speed Safari. This game really does have us laughing and giggling away, from trying to stop the hunter getting your cards to imitating angry animals. It's a recipe for family fun. As I said before the draw string bag is genius so we'll definitely be taking this game away with us on holiday, it's perfect. 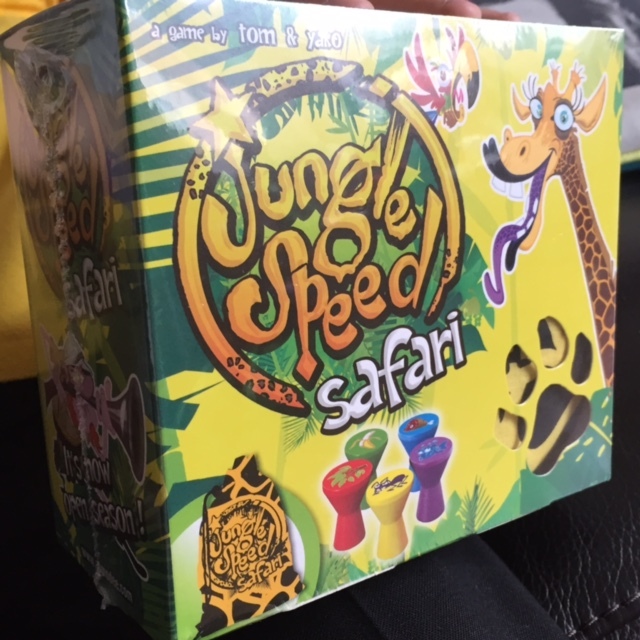 You can purchase Jungle Speed Safari directly from Amazon (RRP £14.99) and it's even down to £12.49 at the moment so saving a few pennies. Or you could try your luck to win this fab game in my giveaway!! 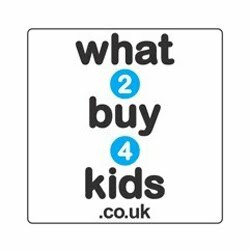 To be in with a chance of winning simply enter via the rafflecopter widget below. I was sent a copy of Jungle Speed Safari in return for an honest review. All opinions are my own. 71 comments on "Review & Giveaway: Jungle Speed Safari"
In our house we love Despicable Me Monopoly and Pig Goes Pop! I would recommend The Logo Board Game, Rapid Dough, Juniour Scrabble and Pigs Go Pop! All fun to play! The tooth fairy game is great fun! I really like the logo games esp the TV version! Buckaroo is always fun. I remember playing it with my grandparents and we still enjoy it. cop-it ! fab game from my childhood that theyve revamped! Kerplunk, not that she knows how to play it properly yet, but it still gives us all a giggle! We love Guess Who and Buckaroo!! We like Pizza, Pizza and Scrabble.